What could be more delightful in summer than this Ice Cream Bead Pattern created by the FreeKidsCrafts Team. 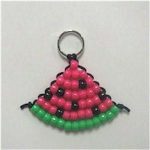 Kids will have fun making this to hang from their key chains or backpacks or to give as a gift to a special friend. Stiffen the ends of the cord with white glue. Let dry. Tie a lanyard hook or key ring to middle of the cord. On the right hand cord string on one red pony bead. With the left hand cord go through the same bead in the opposite direction. Pull on both cords, tightening the beads up close to the lanyard hook. Repeat with the second row, stringing on 4 pink pony beads. Weave a total of seven rows using the pattern as a guide. Tie off each cord close to the last bead. Dab a bit of white glue on each knot. Let dry. Trim.